Summary: Wilhelmina has a hundred enemies. 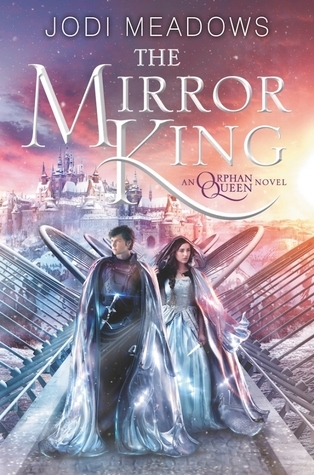 My Thoughts: Yep, as soon as I finished the last page of The Orphan Queen I had to jump right into the Mirror King! After that ending, OMG! We are back with Will and all her crazy and wild friends and not so friends! I’m so happy it pretty much started where the last one left off. I’m so glad! I needed to know what happened! And I can’t say much about it without giving away spoilers soooo shhhhhh. I really loved that we are back on the mission on what in the heck is Will going to do and how is she going to save her kingdom. We also see a lot of sadness but there is happiness to make you swoon too. Man I just zoomed right through this one. I stayed up late just wanting to know what happened. And, I’m glad we got to know Will even better. And her best friend. And her nemesis. So much happened, and so much devastated me. I laughed, I cried, I swooned. I just really enjoyed this one. I want to say more but I’m afraid I’ll give away spoilers so I’m going to stop there. Overall: I LOVED THIS ONE! I think I liked it better than the first one even. I just love all the characters and I love learning more about them. I love that she can take care of herself but she also wants to truly be taken care of. She wants love, she wants it, she’s just afraid to have it. I highly recommend this series, and I’m glad we got some kind of resolution. I’m glad how things went for the most part, even though there was a bit of sadness there but I still loved it! Recommend this series! Cover: Love it. Hadn’t really looked at it up close until recently. Its nice.